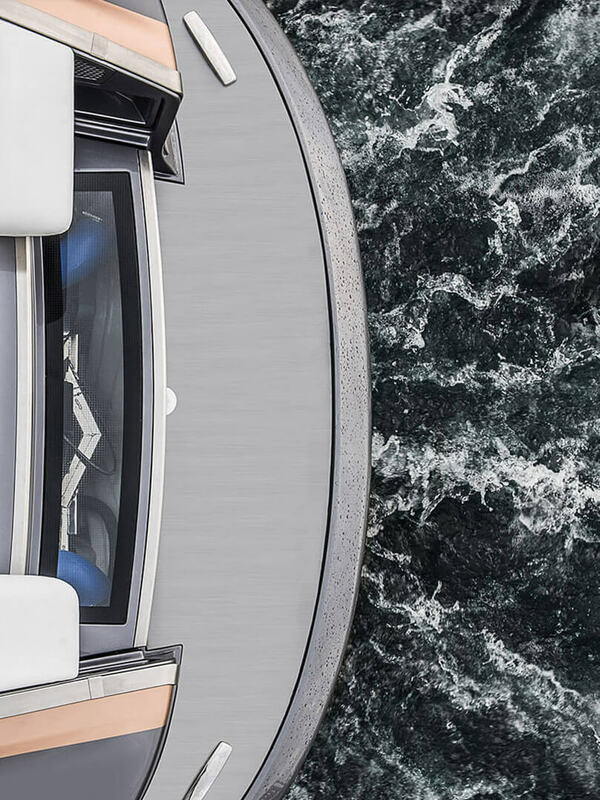 Discover our new high-performance 42-foot concept sport yacht powered by two 5.0-litre Lexus V8 engines. This stunning sea-faring Lexus is the perfect addition to the Lexus lifestyle. A few years ago, the Toyota Marine Department invited TMC President Akio Toyoda to spend several days on the water driving the new Ponam range of premium yachts soon to be launched in Japan. As a master driver, Akio Toyoda was inspired by the power of the turbodiesel powertrains and the handling and stability of the advanced hull designs; as the Chief Branding Officer of Lexus International, he also appreciated the potential of a stylish premium performance yacht to complement the Lexus lifestyle. 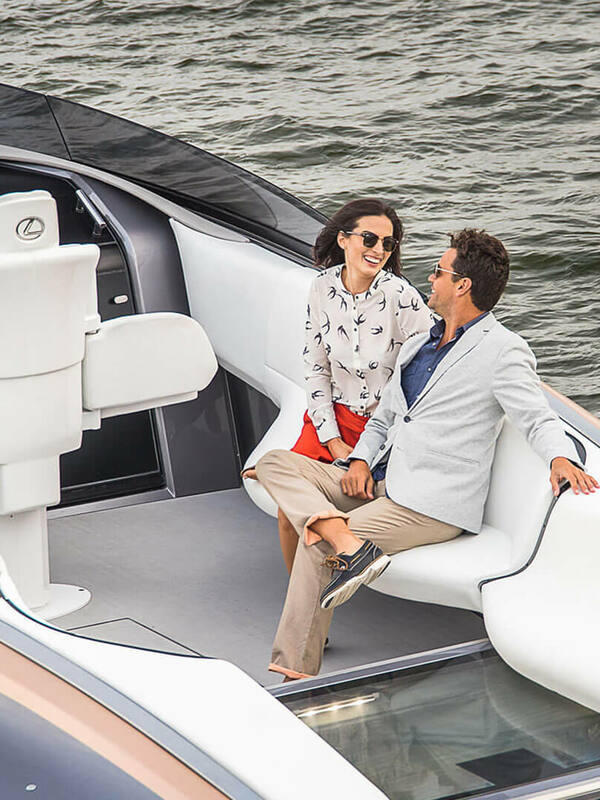 This led the Marine Department to reimagine how a premium performance yacht might expand the Lexus brand into new areas of lifestyle and recreation. 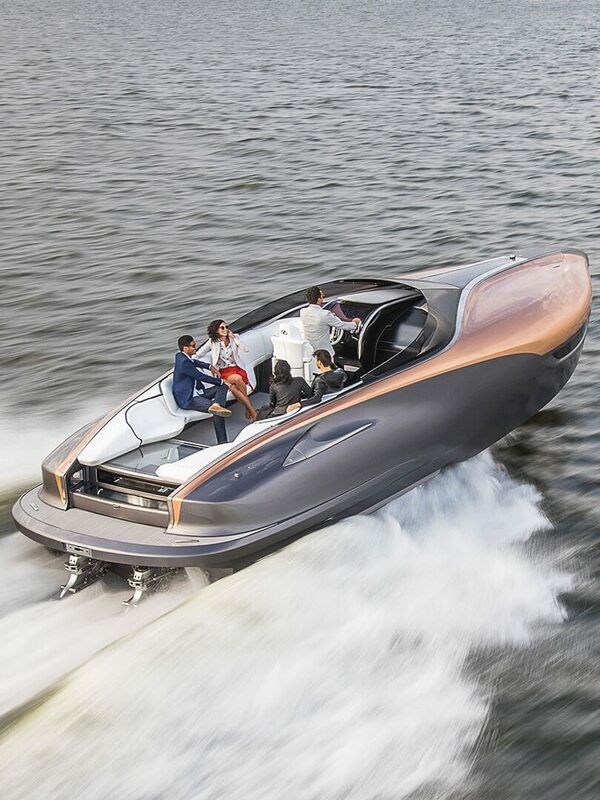 On January 12, 2017, Lexus revealed the result of this project: a running proof-of-concept for a Lexus Sport Yacht, at Di Lido Island on Biscayne Bay, Miami Beach FL. A brief for an open sport yacht for recreational day-touring with six to eight guests, powered by twin high performance Lexus V8s and with advanced styling and handling was given to the Lexus Design Centre in Toyota City, Japan. In the summer of 2015 concepts from the design team were evaluated by Senior Managing Officer Tokuo Fukuichi, Chief Officer of Global Design and President of Lexus International Co., Senior Managing Officer Shigeki Tomoyama in charge of the Toyota Marine Department, and President Toyoda. The effort is valuable to us as it stirs our creative energies and pushes our imagination to design and lifestyle possibilities outside of the automotive realm we know well.” The selected proposal continued to be refined throughout 2015 as the Marine Department engineered the construction and on-board marine systems. The Lexus Sport Yacht revealed at Miami is a bespoke one-off project with no plans in place for production. To produce this single example the Marine Department selected the Marquis-Carver Yacht Group of Pulaski, Wisconsin, USA, based on their in-house engineering and manufacturing capabilities, and their skill in large hand-laid composite structures. 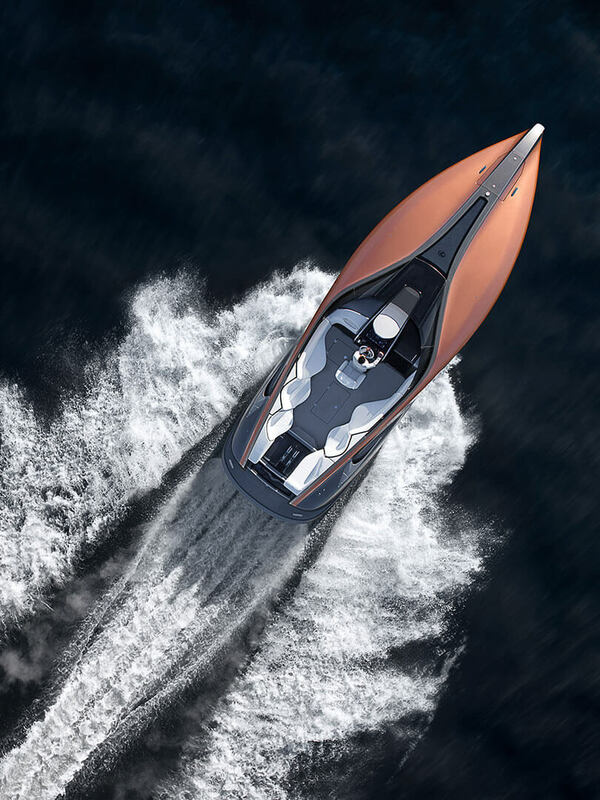 The design of the Lexus Sport Yacht concept has the upper deck and outer hull seamlessly bonded around the inner structure, each piece a single massive hand-laid composite of two-part polyurethane epoxy resin reinforced with hand-laid woven carbon fibre cloth, a composite material called carbon-fibre reinforced plastic, or CFRP. CFRP is the technology used in the structure of race cars and supercars like the Lexus LFA, high-performance aircrafts, competition skis and bicycles, and world-class racing sailboats. The Lexus Sport Yacht concept’s unique CFRP construction saves nearly 1,000 kg compared to a similar yacht in fiberglass reinforced plastic (FRP). The underwater hull design is stepped to reduce resistance or drag and improve handling balance at high speeds. The concept is powered by twin 5.0-litre V8 gasoline engines based on the 2UR-GSE high-performance engine of the Lexus RC F coupe, the GS F sport sedan and the new LC 500 grand tourer. Each engine produces over 440 horsepower / 446 DIN hp / 328 kW, driving the yacht at speeds up to 49 miles per hour (43 knots) through a pair of hydraulically controlled inboard/outboard stern-drives. A bow-thruster with joystick control aids in docking. 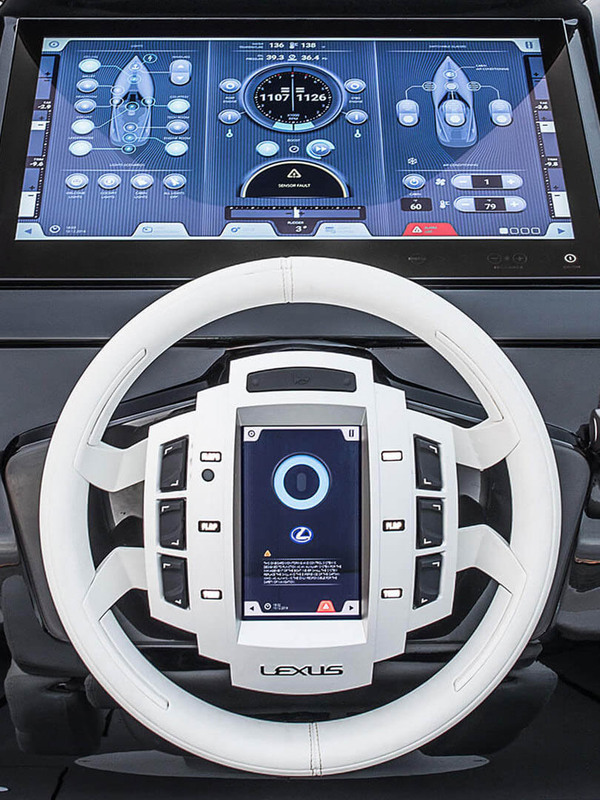 The captain controls and monitors on-board systems from a colour touchscreen panel at the helm; screens show GPS navigation, digital charts, surface radar, underwater sonar, lighting and entertainment systems. The captain’s seat is power adjustable; the armrests fold out to become jump seats on each side for very special guests. The forward passenger cabin is inviting in luxurious Lexus leather with wood and glass details. A standing height, sofa seating for six with a table, and air conditioning create a comfortable environment for intimate entertaining. The galley features a two-burner stove, sink and under-counter refrigerator; a beautifully finished head includes a shower. An integrated audio-video entertainment system is fully networked, with 4G Wi-Fi & WAN. Sound reproduction is by Revolution Acoustics surface-mounted drivers using the ceiling panel as a transducer, powered by a Mark Levinson® Reference digital amplifier. Lexus, a division of Toyota Motor Corporation, was founded in 1989 to develop and produce the finest cars ever built with a commitment to providing the highest levels of customer service. Lexus International was dedicated as a company-within-the-company in 2011 to coordinate all central strategy, planning, design, engineering and production for the brand. The Marine Business Department of Toyota Motor Corporation (TMC) was founded in 1997 to develop premium yachts using advanced technology and quality control methods perfected in making Lexus luxury cars. Toyota Marine’s Ponam line has included fibreglass sport-fishing boats in 26- and 28-foot lengths, and luxury cabin-cruisers in 31-, 35-, 37- and 45-foot lengths with durable and quiet hulls of fully-welded A5083 aluminium alloy. Ponam models are powered by high-efficiency turbodiesel engines based on those of Lexus GX 300d (3.0-liter turbodiesel 4 cylinder) and LX 450d (twin-turbo diesel 4.5-liter V8) luxury utility vehicles. The Toyota Ponam line is the market-leader in the premium yacht industry in Japan. From 1998 to 2002, Toyota Marine also developed and produced the Epic line of fiberglass tournament ski boats and wakeboard boats, primarily for the US market, all powered by the 4.0-liter 1UZ-FE DOHC gasoline V8 from the Lexus LS 400 luxury sedan. Marquis Yachts, LLC, is an independent privately-owned company in Pulaski, Wisconsin, that designs, engineers and manufactures the brands of Marquis Yachts and Carver Yachts. The pinnacle of the Marquis line is a 73 foot, three-level, luxury yacht with fiberglass reinforced plastic (FRP) hull, deck and superstructure. For more information go to www.marquisyachts.com or www.carveryachts.com.